For the past couple of months, we have been talking with the Head of Oncology at the Greater Baltimore Medical Center (GBMC) in Towson about getting our services into their hospital to benefit their young adult population. After many meetings, tours, and emails I hit to ground running today. 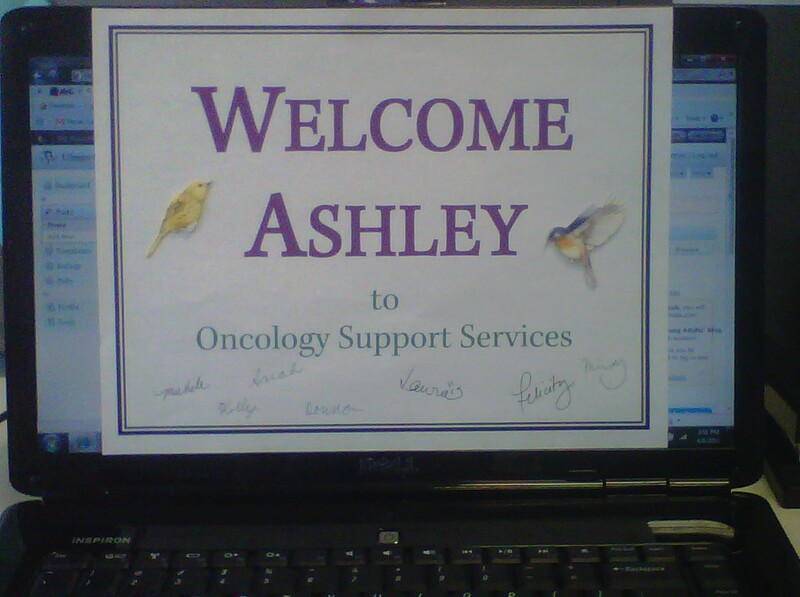 I was given an amazing welcome by the entire Oncology Support Services Staff. I walked in to my little area to see a welcome sign attached to my computer. Everyone came out of their offices to greet me. I began answering questions for the next half hour about UCF and about my story (which I was happy to do)! Mindy Shifflett, the American Cancer Society Patient Resource Navigator at GBMC, and Donna Lewis, the Director of the Oncology Support Services Staff, took me on two tours introducing me to everyone and anyone that we passed! Luckily there are a lot of Cindy’s and Linda’s so remembering names won’t be too tricky (hopefully). I was amazed at how many people on the nursing staff already knew my name. By the time I left the infusion area I had a list of ten young adults who had been referred to me by the nurses. The highlight of my day came around noon when I was able to meet one of the patients that had been referred to me. This young man is an amazing guy with a great outlook and an uplifting attitude. The first thing he said to me was, ” I want to start giving back to other cancer patients.” We sat and talked about life and some of his interests until he was taken back for his appointment. He left very excited about our YACS B’More event tomorrow night. He hopes to make it out. My first day at GBMC was great. I met some amazing people who were all very appreciative that I was there to help their young adult patients. All I heard all day was, “Thank you for being here.” It was truly a wonderful start to a great new partnership. This entry was posted in Patient Navigation, Personal Cancer Stories and tagged Ashley Portrey, GBMC, Greater Baltimore Medical Center, Patient Navigation, Patient Navigation Program, UCF, Ulman Cancer Fund, Ulman Cancer Fund for Young Adults. Bookmark the permalink.